Written by: Karen on April 9, 2016. On paper, it looks good: assemble a great cast, set the scene for the story told in Snow White and the Huntsman, and see what happened next. 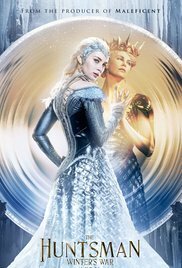 Unfortunately, The Huntsman: Winter’s War doesn’t live up to the billing. Beginning with a narrated sequence that conveys the depressing message that “love doesn’t last forever” and is therefore pointless, it moves on to a horrific scene in which Freya (Emily Blunt) discovers that her baby has apparently perished in a fire. Although there’s a flashback sequence towards the end of the film that shows the evil Ravenna (Charlize Theron) learning from her magic mirror that the baby will grow to become more beautiful than she is, the message that the child is Snow White is easy to miss. Certainly no-one thinks to tell Freya that her daughter is alive and well, which might have saved everyone a good deal of trouble. Instead, there’s more narrative, while Freya storms off to the North and sets up an ice kingdom where love is illegal. Her army (where did they come from?) takes children from villages in the south, and trains them to fight, in a sequence that goes on for far too long. Eventually, two of the youngsters turn into Chris Hemsworth, as Eric – the Huntsman – and Jessica Chastain as Sara, the woman he loves. But love’s not allowed, and the two are separated, till the story picks up seven years later, after Snow White has been crowned. The magic mirror has been stolen, and Eric is tasked with finding it before Freya gets her hands on it. With a couple of dwarves (Nick Frost and Rob Brydon) along for company, he sets off on his quest, encountering goblins, magical beasts and a couple of sweary female dwarves (Sheridan Smith and Alexandra Roach) en route. As the stakes get higher, and the characters are drawn back to Freya’s kingdom for the inevitable climactic fight, a hodge-podge of concepts from other films get stirred into the mix. There are scenarios here that have clearly been inspired by everything from Harry Potter through Indiana Jones and the Last Crusade to The Lord of the Rings – but none of them quite work. They’re not set up well, or they’re not clever, or they’re not funny; or it’s not clear exactly what happened and why. It doesn’t help that Hemsworth and Chastain are saddled with faux-Scottish accents that they struggle with, and sometimes forget completely. On the plus side, there are a few genuine laughs, the action scenes are crunchingly brutal without being bloody enough to rate a UK 15 rating, and the SFX are well done. It’s a film that is ultimately about love conquering all – but it lacks the heart that should make an audience care.